In the meantime, all comments welcome ! Escadrille equipment was soon standardized as 6 aircraft, plus spares (totaling 7-9), each supported by a heavy truck used for carrying fuel and spare parts. The Escadrille commander had a tourer car and a despatch rider was attached. An Aviation Park Support Section, consisting of three lorries, one workshop vehicle and two motorcycles, served with the Escadrille. The commanding officer was nominally a Capitaine, with a Lieutenant and Sous Lieutenant below him. There were three NCO pilots, all of whom held the rank of Corporal or above. A rigger and a mechanic were attached to each pilot, and moved units with him. The mechanic frequently flew as a gunner. The exception was when an observer officer was being carried. By the end of the war the pilot establishment had been raised to 18. Captain de Saint-Quentin was appointed as commanding officer in 1912. The 1913 French Army manoeuvres were carried out in south west <? : prefix = st1 ns = "urn:schemas-microsoft-com:office:smarttags" />France between Agen and Toulouse and involved BL9. These proved to be a triumph for the aviation service, which managed to maintain an hour by hour surveillance of ground troop movements. On the outbreak of war, on 2 August 1914, BL9 was assigned to 1st Armee at Epinal, operating a mixture of Bleriots and Maurice Farman MF7s in support of 7 & 21 Army Corps. Captain Armand Desprez de la Morlais assumed command. Between 7 and 11 August these units were involved in the Battle for Alsace, attacking in the Mulhouse and Belfort areas. A move to Rambervillers was carried out on 15 August to take part in the battle of Sarrebourg on 20 August, and a return to Epinal on 23 August. The battle de la Mortagne began on 25 August and continued to 11 September. The Germans counterattacked on 21 September, leading to the battle of Flirey than continued until 13 October. On 22 September, however, BL9 moved to Villers-les-Nancy, in Meurthe-et-Moselle, and was to remain there for almost 12 months in support of the 1st and 8th Armees. There were no designated artillery co-operation escadrilles on the outbreak of war, as they were in the process of choosing a new aircraft type with an improved downward view. Trails were still being conducted as war broke out, and so the only improvement to existing equipment was the modification of some of the Bleriot XI-2 monoplanes to become parasols, in line with modifications suggested by Lieutenant Gouin. Thus BL9 concentrated on reconnaissance, noting rail and troop movements. The aircraft were initially unarmed, though fletchette steel darts were available for attacking ground targets. BL9 suffered its first casualties on 22 October 1914 when Sub Lieutenant Reymond was mortally wounded and Adjutant Alfred Clamadieu killed by infantry fire, after their aircraft had experienced engine trouble during reconnaissance over Chambley, Mars-la-Tour and Thiacourt. Clamadieu was forced to land between the lines near Limey. Reymond was rescued by members of the 367th Infantry regiment about 3 hours after the crash and taken to hospital in Toul, where he succumbed to the bullet that had punctured his kidney. Reymond, a Senator and the head of the Comite National pour l’Aviation Militaire, was called up as a Medical Officer 1st Class, and thus had no need to serve as an observer. In accordance with tradition, Reymond gave his report from his hospital bed and General Dubail pinned the Cross of the Legion of Honour on him just before he died. Jules Charles Covin, a future ace, was posted to C9 after passing his Brevet on 30 January 1915, and served with the unit until 28 August 1916, when he was posted to MF52. As manufacture of the Bleriot XI-2 was halted in 1914 and the Bleriot factory instructed to manufacture the Caudron GIII instead, no replacement aircraft were available for BL9. The Bleriot soon proved to be of limited operational use as the structure deteriorated markedly when the aircraft was left outside overnight. Caudron GIII biplanes were supplied to BL9 from 7 February 1915, and these were supplanted with the Caudron GIV twin-engined aircraft as these became available. By August equipment had been standardized with the Caudron GIVA2, and this was recognized by a change of title to Escadrille C9. Captain Pierre Escot de Bondy assumed command on 18 February, and C9 continued its main roles were of artillery observation and reconnaissance, with the Caudrons continuing to be called upon to be used as bombers should the need arise. All of the aircraft carried large letters painted on the outside of planes above and below aircraft to distinguish each crew. "This impulsive and audacious pilot did not hesitate on a scouting expedition to approach a German warplane within 37 yards, so as to permit the observer to shoot at it. - General Hambert, Commander of the D.A.L." On 5 April the French attacked in what was to become known as the first battle of Woëvre, where the fighting continued until 5 May. Henri Salmet, whose exhibitions in numerous parts of England did so much towards popularising aviation, has been mentioned in Army Orders. During one of his flights Salmet approached to within 80 feet of a German machine, in order to allow his observer a good chance to disable the hostile aircraft by gunfire. In July 1915 Capitaine Maurice Precardin took over command. On 31 July Sub Lieutenant Perbosc, an observer, was wounded in action. In August BL9 operated on attachment to the Armee de Lorraine, but still operating from Villers. On 10 August Sol Uzeward, a mechanic/gunner, was injured, possibly in a ground accident. "Henri Salmet has fulfilled many perilous missions, showing the greatest coolness under critical conditions. On August 23rd, flying alone, he dropped thirty shells on an important railway station beyond the Rhine. Overtaken by fog, he returned by compass and landed safely on French soil." With regard to the mention made by Lord Northcliffe of two pilots well known on this side of the channel, it is worthy of note that M. Salmet, that pastmaster in the art of piloting Bleriot monoplanes, was responsible for the raid on Karlsruhe some time ago." On 13 September 1915 C9 moved to Dogneville, where it remained for a while, not returning to Villers-en-Nancy until some time in 1916. Sergeant Leclerc, a pilot, was injured in an accident on 13 February 1916. On 10 March Sub Lieutenant Delerue and his observer, Sub Lieutenant Jacques Perbosc, were killed in action near Bezange. Arthur Marie Marcel Coadou joined C9 at Villers-les-Nancy on 9 April. On 18 June he attacked a German aircraft near Nancy and forced it to retreat, although his own aircraft was badly damaged. For this Coadou received his first Croix de Guerre. 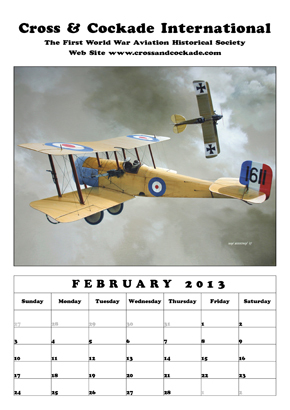 Further attacks on enemy aircraft were carried out on 27 July and 7 November 1916, and 29 January, 1917. These led to promotion to Corporal and the award of a section Croix de Guerre. Coadou undertook long range reconnaissance also, as well as ground strafing troops on 21 January 1917. In April 1917 he was posted out to undertake a conversion course for Nieuports. In June 1916 Lieutenant Jean de Luppe took over command of C9, but only temporarily pending the appointment of Captain Henri Gautray. Corporal Ernest Bresch and his observer, Sub Lieutenant Joseph Ransom, were killed on 25 June when Caudron 1202 was shot down by Leutnant Walter Hoehndorf of KeKv between Rancourt and St Jurgen, in the Vosges. In November Sol Brunerie, a Mechanic, was injured on the 17th, and Sub Lieutenant Henri Rayant and his gunner, Corporal Fayard, were injured on the 21st; all in flying accidents in Caudron GIVs..
On 22 December 1916 Adjutant Pierre Galganic and his observer, Sub Lieutenant Roland Le Meulais, were both injured in a Caudron GIV crash. In March 1917 C9 began operating in support of the 48th Infantry Division and the 39th Army Corps, 6th Armee. During March and December 61 Balloon Company was attached to 39 Army Corps also. Captain Maurice Bosc assumed command on 1 April. On 29 April 1917 Corporal Gabriel Luizet and his observer, Aspirant Gaston Aubry, were attacked by three enemy aircraft while co-operating with the 8 Armee on the Nancy Front. Luizet was wounded but Aubry escaped unhurt. On 20 May 1917 Sub Lieutenant Henri Ruyant and Lieutenant Joseph Chareyre claimed a German scout as probably destroyed. Presumably this scout had attacked the Caudron. German records do not appear to support this claim, and it was not confirmed. On 4 June Sub Lieutenant Barbier, an observer, was injured in a Caudron crash. 24 June 1917, Adjutant Jacques de Montfort and Sub Lieutenant Marius Peyrachon claimed a German scout as probably destroyed in the Nancy area but, again, this is not supported by German records although the French confirmed the claim. Both of these aircrew are recorded as being injured in a crash on the same date, which does suggest that the Caudron was damaged in the engagement. In 1917 C9 chose a blue butterfly on a red as its insignia, a choice supposedly based on the commanding officers tendency to ‘flutter’. Due to the limited performance of the Caudron GIV, and the improvements in German aircraft design, attempts were made to develop a replacement as an A3 class army co-operation aircraft. The Caudron GV, essentially a GIV with a fuselage replacing the short nacelle, proved to be underpowered and the improved GVI was not much better; although C9 operated at least one of the type in late 1916/ early 1917. A number of crashes led to the GVI being grounded for a while, until the fault was traced to stall recovery difficulties. Although some 50 Caudron GVIs were in service at the end of 1916, its operational days were numbered. The STAe determined to develop a new 3-seater long range reconnaissance (A3) aircraft, to be manufactured by the Establishments Letord. Again C9 received at least one Letord 1 to supplement its Caudron GIVs, and the type must have survived the next major re-equipment as a photograph exists showing its unit insignia sporting a blue comet tail similar to those marking the Sopwiths. 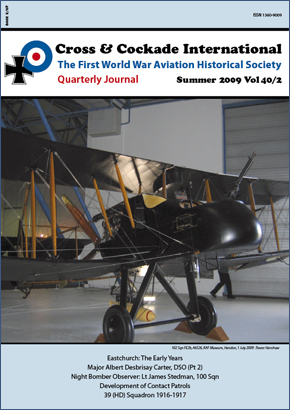 The Sopwith 1A2, a licence-built version of the Sopwith 1 ½ Strutter, began to re-equip C9 from July 1917, following a move to Villeseive on 1 July. A further move to Tartiers, and then to Mon-saint-Martin on 1 October followed. The conversion to Sopwiths was not completed until October, when the name of the unit was changed to Escadrille SOP9. 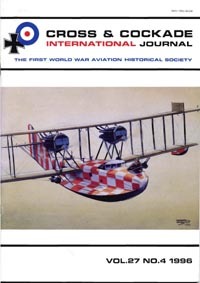 Conversion to the Sopwith was not without incident as Lieutenant Albert de Lamberterie du Cros was accidentally killed on 23 July and his observer, Sol Francois Dumas, was injured when their aircraft crashed at Sainte Maure. Brigadier Elie Fontaine was injured, again piloting a C9 Sopwith, on 6 August. Two encounters with German scouts followed later in the month. On 12 August Marcheal de Logis Gabriel Luizet claimed a ‘probable’ but his Sopwith observer, Lieutenant Minoret, was injured in the encounter. The claim was not confirmed. On 17 August a C9 crew, Sub Lieutenant Georges Rodier (observer), Adjutant Louis Douillet (pilot) and Sergeant Victor Grosch (gunner), claimed the destruction of a German aircraft. This was confirmed. On the same day Lieutenant Claude Lalias was posted as missing when the Letord in which he was an observer went missing in the Chevrigny area. The other two crew, Sergeant Requier (pilot) and Soldat Emile Le Thuiller (gunner), were from Escadrille F220. On 1 September observer Sub Lieutenant Albert Eustace was injured in an accident, as was pilot Caporal Andre Champod on 23 October (“blesse par des tirs venant du sol sur avion”). Sop9 was assigned to the 30th Corps d’Aviation, and moved Ambrief on 5 November 1917, on the Aisne, in support of the La Malmaison offensive. MdL Robert Louis Savlan joined Sop9 as a pilot on 9 September, presumably one of a draft posted in as Savlan had experience of flying Sopwiths at Avord. Savlan was to remain with Sop9/Br9 until 23 July 1918, from 23 July flying Breguet 14 number 205. Towards the end of the year Captain Robert Barthelemy was posted in as commanding officer. On 10 December a claim was made against a German reconnaissance aircraft over Grandelain, but this was unconfirmed. On 21 December 1917 39th Army Corps was dissolved, and Sop9 worked with a succession of units; the first of which was 161 Infantry Division in February. Lieutenant Maxime Maret was fatally injured in a Sopwith crash at Mont-Saint-Martin on 9 February and his observer, Mechanic Soldat Guillaume Lavalette, was injured. Maret died in the ambulance later. On 3 March 1918 Sop285 was formed from a cadre of Sop9, and moved to Tartiers, where it was joined by Sop9 on 15 March. On 28 March Adjutant Jean Brut and his observer, Adjutant Escoffre, were posted missing in their Sopwith, but are believed to have been killed in action in between Anizy-le-Chateau and Servais. The Sopwith was obsolescent when it entered service in large numbers with the Aviation Militaire. By then, however, there was manufacturing commitment to build the type under licence. A better aircraft was the Salmson 2A2, which was to serve with Sopwith escadrilles in small numbers before it joined the Breguet 14 in replacing the British design. Actual numbers of Salmsons operated by Sop9 at any one time remains obscure, though it is known that the similar C6 replaced its Caudron GIVs with three Sopwiths and six Salmsons. Sop9 worked with 19 Army Corps in May 1918 and was then withdrawn for training to Moissy-Cramayel , on completion of which the crews went to Etampes on 30 May 1918 to collect Breguet 14A2s and the unit changed to Br9. Br9 was assigned to the 19 Army Corps, as an observation unit. From Etampes the Escadrille served during the Champagne offensive and the Second Battle of the Marne, in co-operation with 161 Infantry Division, 8 Army Corps, 4 Armee. Operating in July 1918 from Noirlieu, a move from Noirlieu to Bessoncourt followed on 23 October, and in November Br9 was based at Phaffans, near Belfort, attached to 7 Armee. Lieutenant Robert Lahaye took over command from Captain Adolphe Schlumberger on 28 October. Sergeant Gauthier was killed on 4 September while flying Breguet 6309 forcing the gunner, Sergeant Gaston Mulot, to land the aircraft. On 28 September Corporal Arnold Moser was wounded in action and forced to bring his Breguet down in German lines near Vouziers. Moser and his observer, Sub Lieutenant Henri Leconte des Floris, were both captured. The following day Captain Schlumberger’s Breguet was attacked and his observer, Aspirant Pacquet, wounded. Br9 suffered its last losses of the Great War on 8 November when Corporal Vacquie was mortally wounded and his observer, Sergeant Anthonin Pardoux, was injured in the ensuing crash. Thus Escadrille 9 ended the war having lost ten aircrew killed and two prisoners, with a further six wounded in enemy action. Three more had been killed in flying accidents and another 13 injured. Escadrille Br9 formed part of the Rhineland Occupation Force in support of 7 Armee, based at Neuf-Brisach from 26 November, and disbanded there on 31 December 1918.